The Novogratz Vintage Tufted Ottomanwill add an aura of character to your room unlike any other. The Victorian-style legs combined with velour upholstery and classic diamond tufting work together to provide a sought-out vintage look which will inspire and excite your guests. Pair this ottoman with the Novogratz Vintage Tufted Sofa Sleeper II to transform your living room into a unique space. 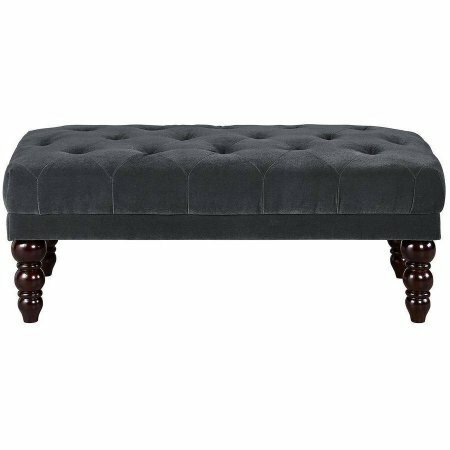 ◘Ottoman dimensions: 39.5"L x 21.5"W x 15.5"H.
◘Box Dimensions: 40.5"L x 23"W x 7.5"H.
Elegant vintage design, Velour upholstery with diamond tufted cushion. Pair it with the Novogratz Vintage Tufted Sofa Sleeper II and/or Ottoman to achieve a complete look. Box dimensions: 40.5"L x 23"W x 7.5"H, Weight limit: 200 lbs. If you have any questions about this product by Novogratz, contact us by completing and submitting the form below. If you are looking for a specif part number, please include it with your message.